Surprisingly, I really enjoyed Captain Marvel. I came into it with low expectations for the movie and even lower ones for Brie Larson, but both proved me wrong. It’s a fun movie, it has great action sequences and it sets up nicely Avengers: Endgame. The other characters were much more fun to watch. Young Nick Fury is adorable, especially seeing his relationship with Goose. It was a huge difference from the the grumpy man we know now. Ben Mendelsohn also gave a strong performance, with a cool mix of mean and funny. Annette Bening was lovely as the mother figure for Carol Danvers, and Jude Law had an interesting character arc (damn, he is everywhere these days, right? Captain Marvel, Fantastic Beasts, King Arthur, and so on). The storyline was interesting, although the whole alien / skrulls bit felt too Science Fiction for me, but overall I enjoyed it, especially the twist at the middle point. It was cool to see how she came into her powers, although I don’t get how she is one of, if not the most powerful Avenger. Judging from what I’ve seen, Vision seems more powerful, and Scarlet Witch has a similar type of power to hers. Oh well, Endgame will probably tell us more. The first after credit scene is tied to the Avengers movie, so make sure you stay to watch it. The soundtrack included a lot of 90s classics and after hearing a couple of them, whenever another one would start, I would wonder how much did it cost to get them all cleared for this movie? They probably spent millions on this. 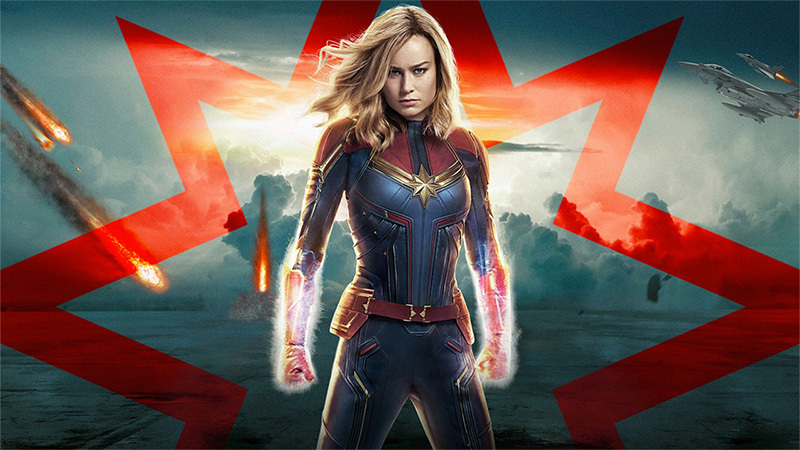 In the end, Captain Marvel is an enjoyable superhero movie that sets up the story nicely for Endgame, where she will probably have a big part in. Not the most likeable or fun character in the Marvel universe, but a cool addition to the team. True…maybe I just didn’t understand her powers as well as I should have 🙂 Still, I liked the movie. I had a lot of the same worry fears about Larson. I liked her better than I thought but she didn’t connect that well for me if it makes sense? Maybe it’s the comedy? She seems almost to be trying to hard in some places whereas up against Jude Law and Jackson they just felt more natural. The drama stuff and with Bening was where she worked best I think. Overall it was still fun and I’m glad you enjoyed it! In April, and apparently it has great reviews so far, but I don’t think it will appeal to everyone, it’s more childish. Great review! I’ve always loved Brie Larson but I was a bit nervous about her being a part of the MCU for some reason. She did such a great job though! Samuel L. Jackson was so, so funny, him and Goose were my favourites for sure! Goose was amazing, it definitely provided some huge laughs in my local cinema. Thanks! Nice review! I thought Captain Marvel was a fun movie. I feel like it’s a few years too late to catch everyone up on her story now, especially right after Infinity War and right after Endgame, but they did a nice job with it. I’d like to see how she grows into the role with her own sequel. Agreed. I also want to see how she interacts with the other Avengers. I’m so excited for Endgame!!! Thanks!